I am often asked where I find my inspiration from and whilst travel is an obvious one magazines and the web are also fabulous resources. Not to sound negative but there seems at the moment an overload when it comes to online magazines, everyone and anyone is shoving one together and so many of them are so awful. I am sure I will get shot down from above for vocalising such a thought but they feel so amateur, the features, the photographs and the terrible homes I could go on but I have a head ache and little energy this morning to sound off. There are a few, just a few that are worth looking at listed in order of preference: Lonny (Lonnymag.com),Â Sweet Paul (www.sweetpaulmag-digital.com ) andÂ maybe Rue ( www.ruemag.com )Fabulous photography, homes that are worthy of sharing and are in some way tantalising and inspiring, which is surely the point no? I also always read on a Thursday the New York Times Home and Garden section (http://www.nytimes.com/pages/garden/index.html), as well as Rita Konigâs features for the Wall Street Journal . I dip in and out of US Elle Dec (more out than in) and subscribe to UK Elle Decoration, Livingetc, Inside Out, Vogue Living and Italian Elle Dec. I hoard magazines and have issues going back to 1995 can you believe which I reference with a post it note and plonk on shelves. Even if you’re not doing up your home but love an image mark it, tear it out, scan it whatever just reference it so when the time comes you have a capsule collection of images that you love. I also scan photographers websites to look at their inspiring work as well as buying heaps of interior books Decorate by Holly Becker and Joanna Copestick being one of my favourite buys this year , plus Sibella Courtâs new tome Â and Martin Thompson’s latest Â are onÂ my Christmas list! 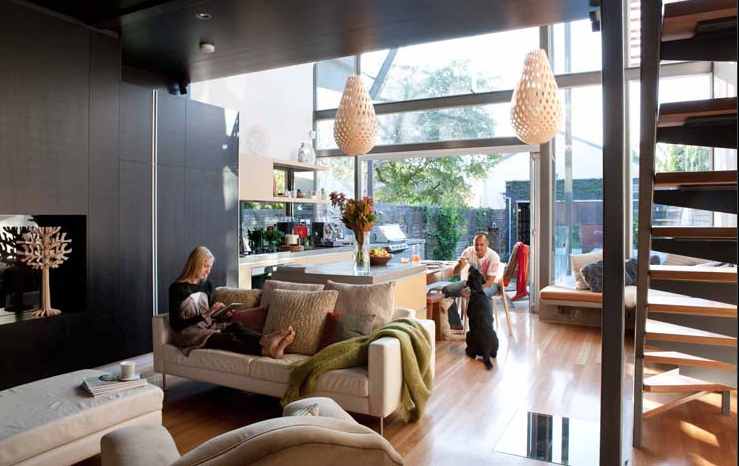 An inspiring image below from photographer James KnowlerÂ – a perfectly designed open plan living space.